The three historic neighborhoods of the Peachtree Battle Alliance were carved out of Fulton County rural forest and farmland in the early 20th century as residential growth in the City of Atlanta stretched from downtown, north along Peachtree Road. The establishment of the streetcar line to Buckhead and growing availability of automobiles led to the development of early residential suburbs in Fulton County, five miles from the congested conditions of the City. The fertile land north of Peachtree Creek has a long history in native American culture as the site of the Creek (also known as Muscogee) Indian settlements, the most prominent being Standing Peachtree at the confluence of Peachtree Creek and the Chattahoochee River. The land bordering Peachtree Creek near Peachtree Road was the site of the infamous Civil War Battle of Peachtree Creek on July 20, 1864, where more than 7,000 Federal and Confederate soldiers lost their lives during the definitive skirmish in the battle of Atlanta. Peachtree Heights Park was developed by Eretus Rivers (for whom E. Rivers Elementary is named) and Walter P. Andrews. Starting in 1910, they purchased 483 acres from the estate of pioneer settler Wesley Gray Collier (Fulton County District 17, Land Lots 111, 112 and 113). New York architects Carrere & Hastings designed the street layout and the Lodge, sited at the entrance to the neighborhood. The small building at the intersection of Peachtree Road and Peachtree Battle Avenue was the real estate office for E. Rivers Realty. In 1937, it was deeded to Fulton County for use as an educational building. 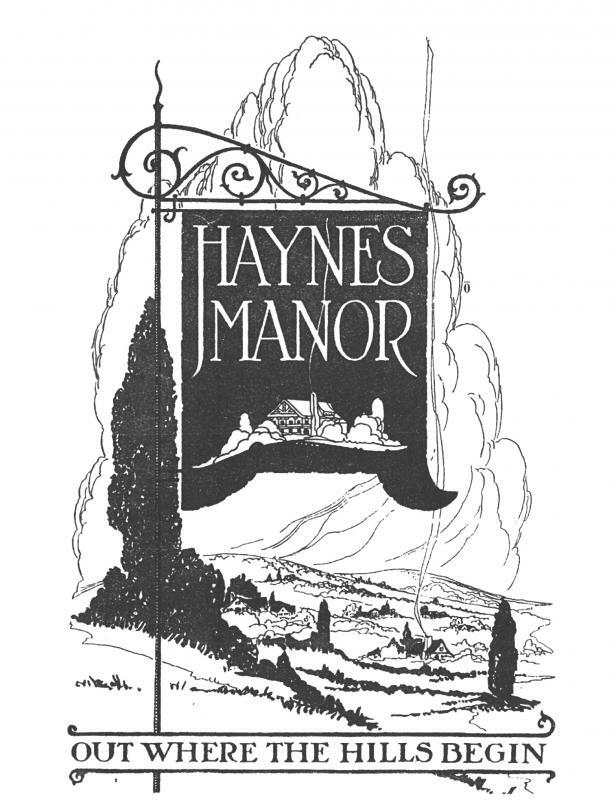 Haynes Manor was developed in 1925 on 190 acres of land contingent to Peachtree Heights Park in Land Lots 144 and 145. Real estate developer Eugene Van Valkenburg Haynes was a prominent Whitehall jeweler, active in community affairs. In late 1926, Haynes deeded 20 acres of land to the City and Fulton County for establishment of Atlanta Memorial Park. A year later, Haynes gave another 36-acre tract for establishment of municipal golf course and clubhouse. Bobby Jones Golf Course opened in December 1933. Westover was first developed by Berry Collins in 1922 as Collins Park, and was renamed Blue Rock Heights in 1924. The 100 acre subdivision, adjoining Haynes Manor on the north and just west of Habersham Road in Land Lot 144, was renamed Westover in 1927 after it was purchased by Lorenz Neuhoff, President of White Provision Company. In 1931, Eugene Haynes sold 75 undeveloped lots in Haynes Manor to Lorenz Neuhoff for improvement. All of these developments, as well as One Peachtree Battle and Nacoochee Place, make up the Peachtree Battle neighborhood. 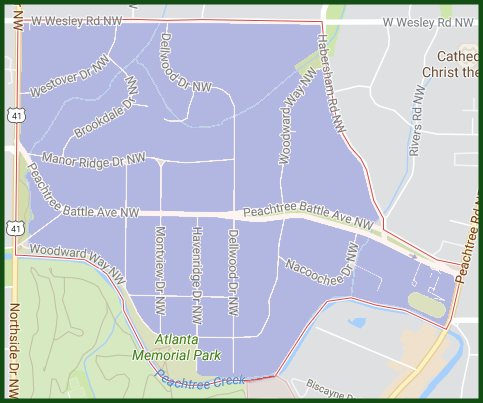 Our neighborhood is shown in the map below, and the Alliance includes the homes located on our border streets of Northside Drive to the west, West Wesley to the north, Habersham Road and Peachtree Road to the east, and Woodward Way to the south.